For other uses, see Guinevere (disambiguation). Guinevere (/ˈɡwɪnɪvɪər/ ( listen) GWIN-iv-eer; Welsh: Gwenhwyfar pronunciation (help·info); Breton: Gwenivar), often written as Guenevere or Guenever, is the wife and queen of King Arthur in the Arthurian legend. Guinevere has been portrayed as everything from a villainous and opportunistic traitor to a fatally flawed but noble and virtuous lady. She has first appeared in Geoffrey of Monmouth's Historia Regum Britanniae, a pseudo-historical chronicle of British history written in the early 12th century, and continues to be a popular character in the modern adaptations of the legend. In the later medieval romances, one of the most prominent story arcs is Queen Guinevere's tragic love affair with her husband's chief knight and friend, Lancelot, indirectly causing the death of Arthur and many others and the downfall of the kingdom. This story first appeared in Chrétien de Troyes's Lancelot, the Knight of the Cart and became a major motif in the Lancelot-Grail of the 13th century, carrying through the Post-Vulgate Cycle and Thomas Malory's Le Morte d'Arthur. The original Welsh form of the name Gwenhwyfar (or Gwenhwyvar), which seems to be cognate with the Irish name Findabair, can be translated as "The White Enchantress" or "The White Fay/Ghost", from Proto-Celtic *Windo- "white, fair, holy" + *sēbarā "magical being" (cognate with Old Irish síabair "a spectre, phantom, supernatural being [usually in pejorative sense]"). Some have suggested that the name may derive from Gwenhwy-fawr, or "Gwenhwy the Great", as a contrast to Gwenhwy-fach, or "Gwenhwy the less". Gwenhwyfach (also spelled Gwenhwyach) appears in Welsh literature as a sister of Gwenhwyfar, but Welsh scholars Melville Richards and Rachel Bromwich both dismiss this etymology (with Richards suggesting that Gwenhwyfach was a back-formation derived from an incorrect interpretation of Gwenwhy-far as Gwenhwy-fawr). Geoffrey of Monmouth rendered her name as Guanhumara in Latin (though there are many spelling variations found in the various manuscripts of his Historia Regum Britanniae). The name is given as Guennuuar in the Vita Gildae, while Gerald of Wales refers to her as Wenneuereia. In the 15th-century Middle Cornish play Bewnans Ke, she was called Gwynnever. The 15th-century English author Thomas Malory wrote her name as Gwenyvere. A cognate name in Modern English is Jennifer, from Cornish. In one of the Welsh Triads (Trioedd Ynys Prydein, no. 56), there are three Gwenhwyfars married to King Arthur. The first is the daughter of Cywryd of Gwent, the second of Gwythyr ap Greidawl, and the third of (G)ogrfan Gawr ("the Giant"). In a variant of another Welsh Triad (Trioedd Ynys Prydein, no. 54), only the daughter of Gogfran Gawr is mentioned. There was once a popular folk rhyme known in Wales concerning Gwenhwyfar: "Gwenhwyfar ferch Ogrfan Gawr / Drwg yn fechan, gwaeth yn fawr (Gwenhwyfar, daughter of Ogrfan Gawr / Bad when little, worse when great)." Welsh tradition remembers the queen's sister Gwenhwyfach and records the enmity between them. Two Triads (Trioedd Ynys Prydein, no. 53, 84) mention Gwenhwyfar's contention with her sister, which was believed to be the cause of the Battle of Camlann. In the mid-late 12th-century Welsh folktale Culhwch and Olwen, she is also mentioned alongside Gwenhwyfach. Guinevere is childless in most stories, the exceptions being Perlesvaus and Parzival (Arthur's son named Loholt or Ilinot) and the Alliterative Morte Arthure. In the latter text, Guinevere willingly becomes Mordred's consort and bears him two sons, although the dying Arthur commands Mordred's children to be killed (but Guinevere to be spared as he forgives her). There are mentions of Arthur's sons in the Welsh Triads, though their exact parentage is not clear. Other family relations are equally obscure. A half-sister and a brother play the antagonistic roles in the Lancelot–Grail (the Vulgate Cycle) and the German romance Diu Crône respectively, but neither character is mentioned elsewhere. While later literature almost always named Leodegrance as Guinevere's father, her mother was usually unmentioned, although she was sometimes said to be dead; this is the case in the Middle English romance The Awntyrs off Arthure (The Adventures of Arthur), in which the ghost of Guinevere's mother appears to her daughter and Gawain in Inglewood Forest. Some works name cousins of note, though these do not usually appear more than once; one of them is Guiomar, Morgan le Fay's early lover in the French romances. The earliest datable mention of Guinevere (as Guanhumara, with numerous spelling variations in the surviving manuscripts) is in Geoffrey's Historia, written c. 1136. It relates that Guinevere, described as one of the great beauties of Britain, was descended from a noble Roman family and educated under Cador, Duke of Cornwall. Arthur leaves her in the care of his nephew Modredus (Mordred) when he crosses over to Europe to go to war with the Roman leader Lucius Tiberius. While her husband is absent, Guinevere is seduced by Modredus and marries him, and Modredus declares himself king and takes Arthur's throne. Consequently, Arthur returns to Britain and fights Modredus at the fatal Battle of Camlann. Early texts tend to portray her inauspiciously or hardly at all. One of them is Culhwch and Olwen, in which she is mentioned as Arthur's wife Gwenhwyfar, but little more is said about her. It can not be securely dated; one recent assessment of the language by linguist Simon Rodway places it in the second half of the 12th century. The works of Chrétien de Troyes were some of the first to elaborate on the character Guinevere beyond simply the wife of Arthur. This was likely due to Chrétien's audience at the time, the court of Marie, Countess of Champagne, which was composed of courtly ladies who played highly social roles. Later authors use her good and bad qualities to construct a deeper character who plays a larger role in the stories. In Chrétien's Yvain, the Knight of the Lion, for instance, she is praised for her intelligence, friendliness, and gentility. On the other hand, in Marie de France's probably late-12th-century Anglo-Norman poem Lanval (and Thomas Chestre's later Middle English version, Sir Launfal), Guinevere is a vindictive adulteress and temptress who plots the titular protagonist's death after failing to seduce him. She ends up punished when she is magically blinded by his secret true love from Avalon, the fairy princess Lady Tryamour (identified by some as the figure of Morgan le Fay). Appearing as Queen Gwendoloena (Gwendolen), Guinevere has prophetic powers in the 12th-or-13th-century Latin romance De Ortu Waluuanii. Such stories can be radically different in their depictions of Guinevere and the manners of her demise. In the Italian 15th-century romance La Tavola Ritonda, Guinevere drops dead upon learning of her husband's fate when Lancelot rescues her from the siege by Arthur's slayer Mordred. In Perlesvaus, it is Kay's murder of Loholt that causes Guinevere to die of anguish and she is then buried with Loholt's severed head. Alternatively, in what Arthurian scholars Geoffrey Ashe and Norris J. Lacy call one of "strange episodes" of Ly Myreur des Histors, a pseudo-historical book by Belgian author Jean d'Outremeuse, Guinevere is a wicked queen who rules with the victorious Mordred until she is killed by Lancelot, here the last of the Knights of the Round Table; her corpse is then entombed with the captured Mordred who eats it before starving to death. Layamon's Brut (c. 1200) features a dream sequence in which Arthur himself hacks Guinevere to pieces after beheading Mordred. Welsh cleric and author Caradoc of Llancarfan, who wrote his Life of Gildas sometime between 1130 and 1150, recounts her being kidnapped by Melwas, king of the "Summer Country" (Aestiva Regio, perhaps meaning Somerset), and held prisoner at his stronghold at Glastonbury. The story states that Arthur spent a year searching for her and assembling an army to storm Melwas' fort when Gildas negotiates a peaceful resolution and reunites husband and wife. The episode seems to be related to an Old Irish abduction motif called the aithed in which a mysterious stranger kidnaps a married woman and takes her to his home; the husband of the woman then rescues her against insurmountable odds. A seemingly related account was carved into the archivolt of Modena Cathedral in Italy, which most likely predates that telling. Here, Artus de Bretania and Isdernus approach a tower in which Mardoc is holding Winlogee, while on the other side Carrado (most likely Caradoc) fights Galvagin (Gawain) as the knights Galvariun and Che (Kay) approach. Isdernus is most certainly an incarnation of Yder (Edern ap Nudd), a Celtic hero whose name appears in Culhwch and Olwen, and who is Guinevere's lover in a nearly-forgotten tradition mentioned in Béroul's 12th-century Tristan and reflected in the later Romanz du reis Yder where a similar character of Queen Guenloie of Carvain (possibly Caerwent) also appears as a lover for Yder. Chrétien de Troyes tells another version of Guinevere's abduction, this time by Meliagant (Maleagant, derived from Melwas) in the 12th-century Lancelot, the Knight of the Cart. The abduction sequence is largely a reworking of that recorded in Caradoc's work, but here the queen's rescuer is not Arthur (or Yder) but Lancelot, whose adultery with the queen is dealt with for the first time in this poem. It has been suggested that Chrétien invented their affair to supply Guinevere with a courtly extramarital lover. Mordred could not be used as his reputation was beyond saving, and Yder had been forgotten entirely. In Ulrich von Zatzikhoven's Lanzelet (c. 1200), Valerin, King of the Tangled Wood, claims the right to marry her and carries her off to his castle in a struggle for power that reminds scholars of her prescient connections to the fertility and sovereignty of Britain. Arthur's company saves her, but Valerin kidnaps her again and places her in a magical sleep inside another castle surrounded by snakes, where only the powerful sorcerer Malduc can rescue her. A version of the abduction of Guinevere is associated in local folklore with Meigle in Scotland, known for its carved Pictish stones. One of the stones, now in the Meigle Sculptured Stone Museum, is said to depict Vanora, the local name for Guinevere. She is said to have been abducted by King Modred (Mordred). When she is eventually returned to Arthur, he has her condemned to death for infidelity and orders that she be torn to pieces by wild beasts, an event said to be shown on Meigle Stone 2 (Queen Venora's Stone). This stone was one of two that originally stood near a mound that is identified as Vanora's grave. Modern scholars interpret the Meigle Stone 2 as a depiction of the Biblical tale of Daniel in the lion's den. The 14th-century Welsh poet Dafydd ap Gwilym alludes to Guinevere's abduction in two of his poems. In Diu Crône, Guinevere's own brother Gotegrim kidnaps her and intends to kill her for refusing to marry Gasozein, who claims to be her rightful husband. Another such story takes place in Hector Boece's Historia Gentis Scotorum, where Guinevere is eventually taken by the Picts after Mordred's and Arthur's deaths at Camlann and then spends the rest of her life in captivity. Medievalist Roger Sherman Loomis suggested that this motif shows that "she had inherited the role of a Celtic Persephone" (from the Greek mythology). All of these similar tales of abduction by another suitor – and this allegory includes Lancelot, who whisks her away when she is condemned to burn at the stake for their adultery – are demonstrative of a recurring 'Hades-snatches-Persephone' theme, positing that Guinevere is similar to the Otherworld bride Étaín, who Midir, king of the Underworld, carries off from her earthly life after she has forgotten her past. In French chivalric romances and the later works based on them, including the influential Le Morte d'Arthur by Thomas Malory, Guinevere is the daughter of King Leodegrance, who had served Arthur's father Uther Pendragon and was entrusted with the Round Table after Pendragon's death. In these stories, Leodegrance's kingdom typically lies near the Breton city of Carhaise (the modern Carhaix-Plouguer). In the fields to the south and east of Carhaise, Arthur defends Leodegrance by defeating King Rience, which leads to his meeting and marriage with Guinevere. This version of the legend has Guinevere betrothed to Arthur early in his career, while he was garnering support. The following narrative is largely based on the Lancelot-Grail (Vulgate) prose cycle, telling the story of Lancelot and Guinevere in accordance to the courtly love conventions still popular in the early 13th-century France but soon afterwards directly condemned in the Post-Vulgate Cycle retelling that was a main source for Malory. When the great knight Lancelot arrives later from the continent, Guinevere is instantly smitten. Following his early rescue of her from Maleagant (in Le Morte d'Arthur this episode only happens much later on) and his admission into the Round Table, and with Galehaut's assistance, she and Lancelot begin an escalating romantic affair that in the end will lead to Arthur's fall. In the Vulgate version, the lovers spend their first night together just as the adulterous Arthur sleeps with the beautiful Saxon princess named Camille or Gamille (an evil enchantress whom he later continues to love even after she betrays and imprisons him). Arthur is also further unfaithful during the episode of the "False Guinevere", her own twin half-sister (born on the same day but from a different mother) whom Arthur takes as his second wife in a very unpopular bigamous move, even refusing to obey the Pope's order for him not to do it. Malory's Le Morte d'Arthur, however, portrays Arthur as absolutely faithful to Guinevere, even successfully resisting the forceful advances of the sorceress Annowre for her sake. Years later, following the Grail Quest, Malory tells his readers that the pair started behaving carelessly in public, stating that "Launcelot began to resort unto the Queene Guinevere again and forget the promise and the perfection that he made in the Quest... and so they loved together more hotter than they did beforehand." They indulged in "privy draughts together" and behaved in such a way that "many in the court spoke of it." Guinevere is charged with adultery on three different occasions, including once when she is also accused of sorcery. Their now not-so secret affair is finally exposed by Guinevere's sworn enemy and Arthur's half-sister, the enchantress Morgan le Fay who had schemed against her on various occasions (sometimes being foiled in that by Lancelot, who had also defended Guinevere on many other occasions and performed assorted feats in her honour), and proven by two of King Lot's sons, Agravain and Mordred. Revealed as a betrayer of his king and friend, Lancelot fights and escapes. Incited to defend honour, Arthur reluctantly sentences his wife to be burned at the stake. Knowing Lancelot and his family would try to stop the execution, the king sends many of his knights to defend the pyre, though Gawain refuses to participate. Lancelot arrives with his kinsmen and followers and rescues the queen. Gawain's brothers Gaheris and Gareth are killed in the battle (among others, including fellow Knights of the Round Aglovale, Segwarides and Tor, and originally also Gawain's third brother Agravain), sending Gawain into a rage so great that he pressures Arthur into a direct confrontation with Lancelot. Guinevere later returns to Arthur and is forgiven. When Arthur goes after Lancelot to France, he leaves her in the care of Mordred, who plans to marry the queen himself and take Arthur's throne. While in some versions of the legend (like the Alliterative Morte Arthure, which removed French romantic additions) Guinevere assents to Mordred's proposal, in the tales of Lancelot she still hides in the Tower of London and later takes refuge in a nun convent (at Almesbury in Tennyson's more modern retelling). Hearing of the treachery, Arthur returns to Britain and slays Mordred at Camlann, but his wounds are so severe that he is taken to the isle of Avalon by Morgan. 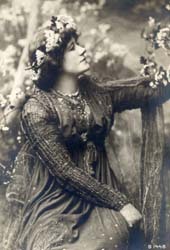 During the civil war, Guinevere is portrayed as a scapegoat for violence without developing her perspective or motivation. However, after Arthur's death, Guinevere retires to a convent in penitence for her infidelity. Her contrition is sincere and permanent; Lancelot is unable to sway her to come away with him. Guinevere meets Lancelot one last time, refusing to kiss him, then returns to the convent where she spends the remainder of her life. Modern adaptations of Arthurian legend vary greatly in their depiction of Guinevere, largely because certain aspects of her story must be fleshed out by the modern author. In spite of her iconic doomed romance with Lancelot, a number of modern reinterpretations portray her as being manipulated into her affair with Lancelot, with Arthur being her rightful true love. Others present her love for Lancelot as stemming from a relationship that existed prior to her arranged marriage to Arthur. In the Deverry Cycle book Darkspell, the character of Gweniver is a warrior priestess sworn to the Goddess of the Moon in Her Darktime, also known as She of The Sword-Struck Heart. An inspirational warleader, Gweniver is a berserker in combat. Lavinia Collins's Guinevere is a historical romance trilogy dealing with Guinevere's marriage to Arthur and the subsequent development of her relationship with Lancelot. Along with typical themes of the romance genre, this adaptation also deals with concepts of magic and religion and builds on Collins's reading of Le Morte d'Arthur. In Marion Zimmer Bradley's The Mists of Avalon, Gwenhwyfar is brought up by a cold, unloving father, which leaves her with a deep inferiority complex and intense agoraphobia. Failing to produce an heir and unable to be with the love of her life, Lancelot, she falls into a deep depression and – hoping for salvation – becomes an increasingly fanatical Christian. Bradley's version is notable for popularising the Welsh spelling, which many subsequent writers have adopted. Guinevere is a supporting character in Gerald Morris' The Squire's Tales. She starts the series as King Arthur's newly-wedded queen and ends it as Sister Arthur, peacefully living in a convent after Arthur's departure. Bernard Cornwell's Arthurian series of novels The Warlord Chronicles depicts Guinevere as the princess of Henis Wyren in North Wales. She is fiercely anti-Christian as a devoted follower of the Ancient Egyptian goddess Isis and has ambitions of becoming queen of Dumnonia through her marriage with Arthur, the illegitimate son of Uther Pendragon in the novels. Guinevere is the cause of a civil war in The Winter King and later conspires with Lancelot against Arthur in Enemy of God, albeit later they reconcile as she plays a vital role in the victory at Badon and eventually she and her son accompany the wounded Arthur to exile after Camlann at the end of Excalibur. Guinevere is a central character in the Broadway musical Camelot, in which she was initially portrayed by Julie Andrews, then Sally Ann Howes. She was played by Vanessa Redgrave in the film version of the musical. In the television series Guinevere Jones, Guinevere is reincarnated into the main protagonist Gwen Jones portrayed by Tamara Hope. In the film King Arthur, Guinevere, played by British actress Keira Knightley, is depicted as a Pictish princess in captivity of a Roman noble family in the far north of Britain. Arthur, charged by Bishop Germanus with escorting the family to safety in light of an impending Saxon invasion, discovers her captivity and liberates her. While travelling back to Roman territory, she introduces Arthur to Merlin who attempts to persuade Arthur to lead the Picts (called Woads in the film) to battle the Saxon army. Once back in Roman territory, their relationship culminates in a brief romance, after which Arthur decides to remain at the Roman outpost to fight the Saxons at Hadrian's Wall while his knights return to Rome. In the climactic Battle of Badon Hill, Guinevere leads a Pictish detachment of archers against the first wave of Saxon invaders and is nearly killed there before being rescued by Lancelot. Following the battle, Arthur and Guinevere are married by Merlin in a ceremony at Stonehenge. In the cartoon series King Arthur and the Knights of Justice, Queen Guinevere is voiced by Kathleen Barr. She is Camelot's queen and the real King Arthur's wife who often wonders about the change in Arthur's demeanor and manner of acting, unaware of him being the time-stranded Arthur King. Guinevere appears in the animated series King Arthur's Disasters, where she is voiced by Morwenna Banks. In the television series Merlin, Guinevere (called "Gwen" by most of the characters) is portrayed by Angel Coulby and is shown as the daughter of a blacksmith and maid to Morgana along with being her best friend. Elyan the White is portrayed as her brother, and, eventually, one of Arthur's knights. At first, Guinevere is implied as the love interest of Merlin (who is far younger in the series than in usual tales) and is also shown as having an attraction to Lancelot. However in this version of the story, Guinevere's true love is Arthur. Gwen and Arthur marry, despite Uther's and Morgana's attempts to keep them apart. Following Arthur's death, Gwen herself becomes Queen of Camelot. In the television series Camelot, Guinevere is depicted by Tamsin Egerton. An ambitious and strong-willed woman, she is a great support to Arthur and they develop a strong undeniable attraction. However, she is married to Leontes, one of Arthur's most loyal knights, which frustrates their relationship. In the TV show Legends of Tomorrow episode "Camelot/3000", Guinevere is portrayed by Elyse Levesque. In the episode, she is a knight who became queen because of her loyalty to Merlin. In response to Sara letting her know of her affection for Guinevere; Sara Lance felt attraction to her, and after Merlin, who was actually Stargirl, confessed her love to King Arthur, she and Sara shared a kiss. Guinevere appears in television series Once Upon a Time, played by actress Joana Metrass. This version of Guinevere is portrayed with a noticeable Castilian accent. In the American original version of the animated series Princess Gwenevere and the Jewel Riders, Gwenevere (Gwen) is the show's titular main heroine and protagonist, voiced by Kerry Butler in the first season and Jean Louisa Kelly in the second season. Gwen is a daughter of Queen Anya and King Jared from the royal family of the magical kingdom of Avalon, who takes up the sacred Sun Stone and bonds with the flying unicorn named Sunstar to lead the all-girl Jewel Riders on their quest to rescue her mentor Merlin and to defeat the witches Lady Kale (Gwen's evil aunt) and Morgana before they can rule Avalon. Gwenevere was renamed Starla for the show's international version, Starla and the Jewel Riders. ^ Schrijver, Peter (1995). Studies in British Celtic Historical Phonology. Rodopi. pp. 249–250. ISBN 978-9051838206. ^ Hamp, Eric P. (1996). "Varia: 1. 1 sál m. '(eau de) mer'; 2. 1 sed 'cerf'; 3. slabar; 4. slice 'coquille'; 5. ta- 'obtenir, trouver, pouvoir (féad-<ét-)'; 6. 1 tadg 'poète', 1 tál 'asciam'; 7. Irish tarr, torrach; 8. tinaid; 9. tindabrad, Findabair; 10. 1 úall, úabar, úais; 11. *uern~?". Études Celtiques. 32: 87–90. ^ Koch, John T. (2006). Celtic culture: a historical encyclopedia. Abc-clio. p. 861. ISBN 978-1851094400. ^ Dictionary of the Irish Language (ed. E G Quin et al., Royal Irish Academy, Dublin 1913–76; Letter S, Column 205, electronic version at http://www.DIL.ie). ^ Richards, Melville, "Arthurian Onomastics", in: Transactions of the Honourable Society of Cymmrodorion, vol. 2, 1969, p. 257. ^ "Cleveland Evans: Jennifer went from 'strange' to popular". Omaha. ^ Bromwich 2006,e p. 154. ^ Rhys, John,Studies in the Arthurian Legend, Clarendon Press, 1891, p. 49. ^ Walters 2001, p. 295. ^ Mediavilla 1999, p. 37. ^ Baron Hallam Tennyson Tennyson, Baron Alfred Tennyson Tennyson (1908). Works of Tennyson, Volume 5. p. 506. ^ Wilentz, Abigail (2009). Relationship Devotional: 365 Lessons to Love & Learn. Lancelot and Guinevere: Sterling. p. 215. ISBN 978-1-4027-5577-4. ^ Christopher W. Bruce (2013). The Arthurian Name Dictionary. p. 243. Routledge. ^ Rodway, Simon, Dating Medieval Welsh Literature: Evidence from the Verbal System. CMCS Publications, Aberystwyth, 2013, pp. 16, 168–70. ^ Noble 1972, pp. 524–35. ^ Hebert, Jill M. (2013). Morgan le Fay, Shapeshifter. Springer. ISBN 978-1137022653. ^ Lacy, Norris J.; Ashe, Geoffrey; Mancoff, Debra N. (2014). The Arthurian Handbook: Second Edition. Routledge. ISBN 978-1317777434. ^ Göller, Karl Heinz (1981). The Alliterative Morte Arthure: A Reassessment of the Poem. Boydell & Brewer Ltd. ISBN 978-0859910750. ^ "Caradoc of Llangarfan: The Life of Gildas". Fordham University Medieval Sourcebook. Fordham University. Retrieved 9 April 2016. ^ Bruce 1999, p. 355. ^ (de Troyes), Chrétien (1990). Lancelot, or, The Knight of the Cart. University of Georgia Press. ISBN 978-0-8203-1213-2. ^ a b c "Historic Environment Scotland". historicenvironment.scot. Retrieved 22 December 2018. ^ Loomis, Roger Sherman (2000). The Development of Arthurian Romance. Dover Publications. ISBN 978-0-486-40955-9. ^ Thomas, Neil (2002). Diu Crône and the medieval Arthurian cycle. D.S. Brewer. ISBN 978-0-85991-636-3. ^ Archibald, Elizabeth; Putter, Ad (2009). The Cambridge Companion to the Arthurian Legend. Cambridge University Press. ISBN 978-0521860598. ^ Spisak, James W. (1985). Studies in Malory. Medieval Institute Publications, Western Michigan University. ISBN 978-0918720542. ^ "While King Arthur was Away, Did Guinevere with Mordred Play?". Children of Authur. 19 June 2011. Retrieved 7 December 2018. ^ Roberts, Sandye; Jones, Arthur (2010). Divine Intervention II: A Guide to Twin Flames, Soul Mates, and Kindred Spirits. AuthorHouse. ISBN 978-1-4567-1255-6. ^ Collins, Lavinia (2014). The Warrior Queen (The Guinevere Trilogy). The Book Folks Arthurian fantasy romance publisher. ^ "Merlin". Merlin TV Series Fansite. Retrieved 5 April 2012. ^ Abrams, Natalie (12 December 2016). "Legends of Tomorrow books The Originals alum". Entertainment Weekly. Bromwich, Rachel (2006). Trioedd Ynys Prydein: The Triads of the Island of Britain (3 ed.). University of Wales Press. ISBN 978-0708313862. Bruce, Christopher W. (1999). The Arthurian Name Dictionary. Taylor & Francis. ISBN 978-0-8153-2865-0. Coghlan, Ronan (1991). Encyclopaedia of Arthurian Legends. Element Books. ISBN 978-1-85230-199-6. Hopkins, Andrea (2004). The Book of Guinevere: Legendary Queen of Camelot. Saraband. ISBN 9781887354042. Korrel, Peter (1984). An Arthurian Triangle: A Study of the Origin, Development, and Characterization of Arthur, Guinevere, and Modred. Brill Archive. ISBN 978-9004072725. Mediavilla, Cindy (1999). Arthurian Fiction: An Annotated Bibliography. Scarecrow Press. ISBN 978-0-8108-3644-0. Noble, Peter (1972). "The Character of Guinevere in the Arthurian Romances of Chretien de Troyes". The Modern Language Review. 67 (3): 524–35. doi:10.2307/3726121. ISSN 0026-7937. JSTOR 3726121. Walters, Lori (2001). Lancelot and Guinevere: A Casebook. Routledge. ISBN 978-0415939119. Webster, Kenneth Grant Tremayne (1951). Guinevere: A study of her abductions. Turtle Press. Wikimedia Commons has media related to Guinevere. This page was last edited on 23 April 2019, at 20:36 (UTC).